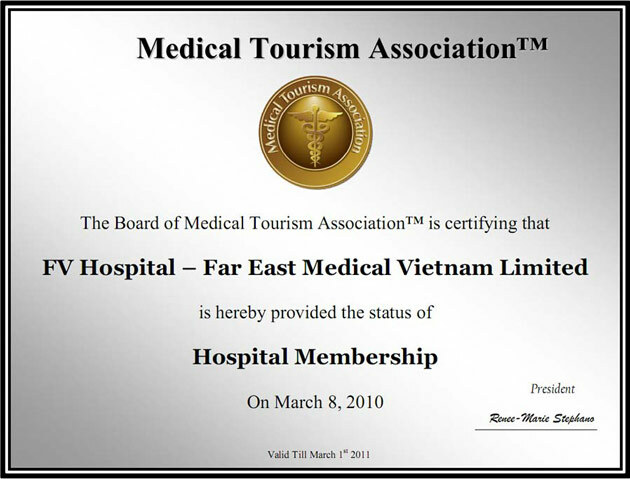 In keeping with our goal of providing international quality healthcare, FV Hospital is staffed by a team of European-trained medical professionals of over fifteen full-time French and Belgian doctors and surgeons together with over fifty overseas-trained Vietnamese specialists, each with ten to fifteen years experience working in key positions in local and international hospitals. Together, they provide expertise in 32 medical and surgical specialities and are highly skilled in the latest surgical and anaesthetic techniques, ensuring that your treatment is as efficient and effective as possible. Via the FVH Partner Programme, we open the hospital facilities to a number of leading Vietnamese specialists in diagnostic analysis and treatment, treating both their own and FVH patients. FVH has also more than 450 doctors from France, Belgium and Switzerland who are shareholders, many of them coming regularly to the hospital to provide consultations and treatment, especially in specific areas of expertise such as knee, shoulder, middle ear, paediatric surgery, etc. At other times, these senior specialists consult with our full-time staff via high-speed internet access, conferring on particularly difficult medical and surgical cases. Radiology images and laboratory tests can be transmitted online and discussed in real time with these international specialists, as well as with our partner laboratories in France. FVH can call on the expertise of over 500 doctors and surgeons for the benefit of patients throughout the year. For cases requiring cardiac surgery and for more complicated cases which we cannot perform at present, FVH has a partnership agreement with the National Heart Centre of Singapore (NHC). A partnership agreement also exists with the Singapore National Eye Centre (SNEC) for ophthalmologic procedures requiring specialist attention. FVH uses the services of world-renowned diagnostic laboratory facilities in France and with Gribbles, the Australian pathology laboratory based in Kuala Lumpur. Nursing and post-operative care are a vital part of the recovery process after surgery. The FVH Nursing Department takes pride in its ongoing commitment to provide the highest international standards of healthcare. The French-trained FVH Director of Nursing is a French national, and half of our head nurses are Vietnamese who have been trained for several years by French head nurses before taking their position. Initially, training of the nursing staff was provided by a recognised international group – the UK-based hospital management company, International Hospitals Group. Ongoing training is now supervised by professional French nursing trainers. Our philosophy is to provide compassionate and comprehensive patient-centred care, both medical and non-medical, to each and every patient. Read more about our nursing care. FVH is equipped throughout with the latest medical technology. By utilising state-of-the-art equipment and cutting edge surgical techniques, we are able to optimise cost efficiency. In combination with the skills of our surgical team, these technologies allow us to perform new minimally invasive surgeries, such as laparoscopy and video-assisted endoscopy. Surgical interventions that once required a whole week to recover can now be performed on a day surgery basis, eliminating the costs associated with lengthy hospital stays and convalescence away from work.